Kerala’s backwaters are beguiling. Life moves at a slower pace on these famous waterways and there’s a distinct sense that dreams can effortlessly be born and nurtured there. 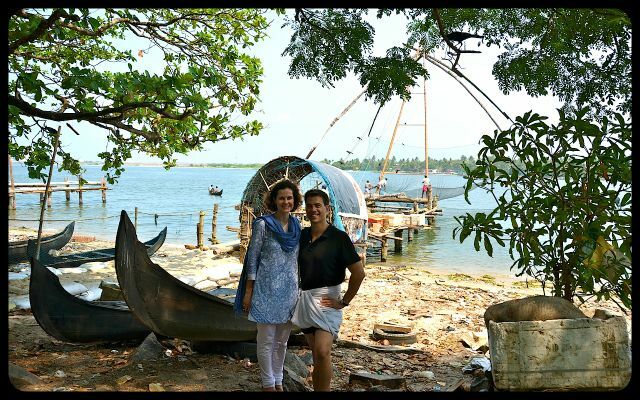 The quiet lagoons and lakes are about 45 minutes from the pleasant tourist town of Fort Kochi, making them the perfect spot to escape the hustle and bustle that is standard, but fascinating fare in India. One of my dear Indian friends back home begged Shawn and me to don traditional Indian attire, snap evidence of our foray on a makeshift catwalk, and then share the images of our masquerade here. 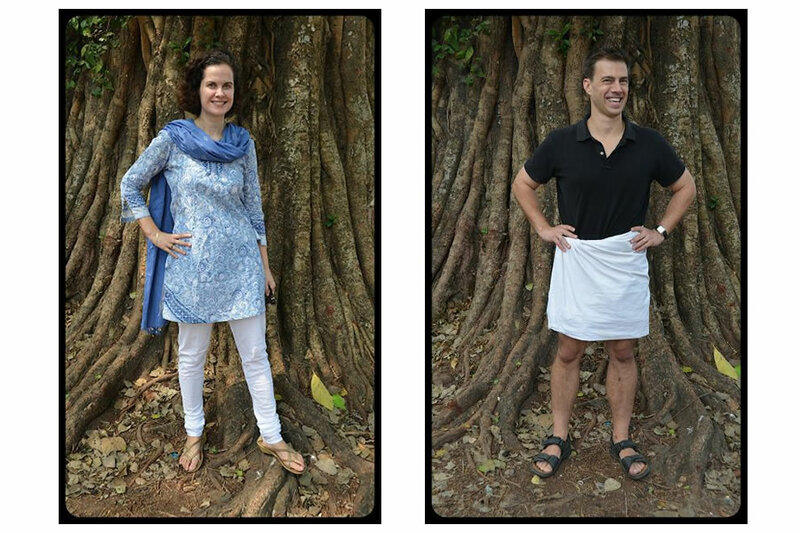 Since space is at such a premium in our luggage, we could not justify the added weight of a man’s traditional lungi (or white sarong-like skirt, worn long or rolled-up, depending upon the heat and humidity levels). 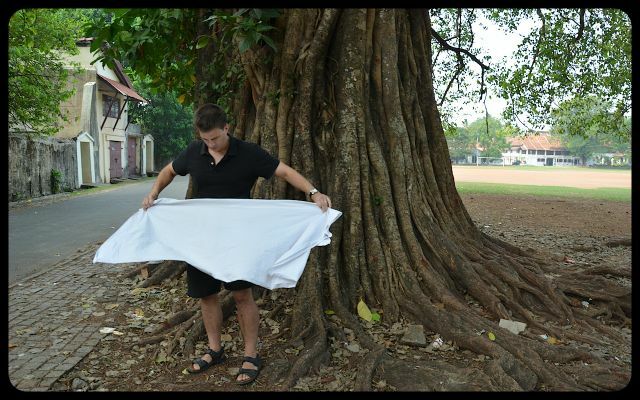 Instead of purchasing the cloth that is so popular with male locals in Kerala, we improvised, and borrowed our guest house’s bed sheet for just under an hour. (Yes, we had to sneak it out using our backpack, but the hotel owner can rest assured that it was unharmed.) As we stepped out onto the street looking for good photo spots, I was thrilled to have yet another excuse to wear my new kurta and stole, in one of my favorite color combinations – grey blue and white. But it was Shawn who stole the show. Perhaps he showed a bit too much leg! 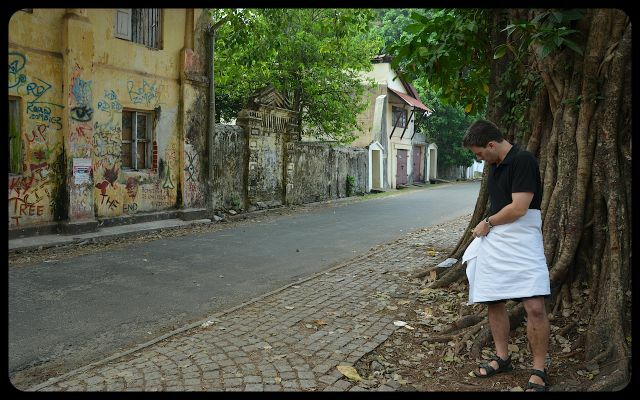 The locals beamed smiles of epic proportions as they saw him attempt to twist and turn the white sheet into a proper lungi. Some men approached by boat (from the waters just behind our makeshift photo studio) while others begged to be in the photograph. I love the ease at which the people of India smile; the zest for life and playful spirit with which they approach life is very special! Hope you enjoy the pictures, Deepti! :) Thank you for the posting idea. 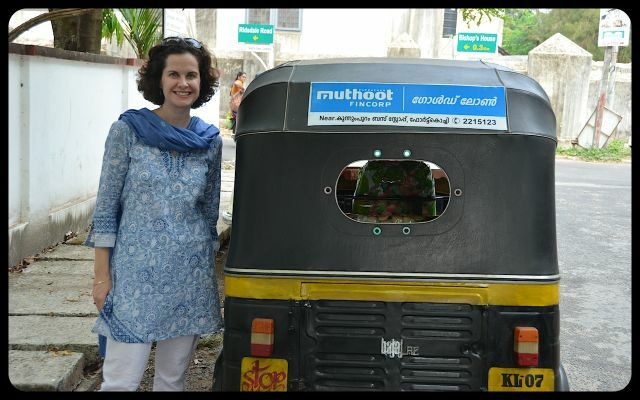 We used Kochi (Cochin) as our hub during our time in the region. From there, it was easy to book day-trips into Kerala’s backwaters, and to Munnar, which we explored next. Need more inspiration? This link contains an index of all my posts from India.